You've never seen them before, right? Yeah, tell me about it. Many of my “make it for them” moments are such ludicrously time-consuming labors of love that I don’t even post them here, because they look like a bad case of Pinterest-perfect mommy syndrome. I’m not perfect. I’m just crafty. And slightly (charmingly??) insane. But this latest project was just so… do-able! It didn’t require hours in front of the TV, hand sewing tiny cones stuffed with batting onto a certain Bowser costume. It didn’t require mad miniature gown-sewing skills like a certain Rosalina plush doll. It was easy!! When I searched for a tutorial before I began, I didn’t find anything that fit the bill. And when something doesn’t exist, apparently I make it. So I’ll make a tutorial. Here ya go. 1) First, buy this stuff. That link is for 10 sheets of Papilio 8.5X11” waterproof vinyl. You can buy single sheets, or 100-packs (or more). It also comes in larger sizes if you have a big fancy printer that can handle that kind of action. Note: This vinyl is designed to work with inkjet printers only!! You need access to an inkjet printer. They do also make a laser printer vinyl. 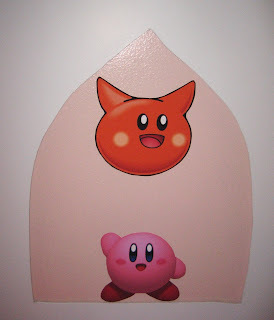 It is likely the same adhesive and would work the same, but I didn’t test that, so I don’t know. 2) Find images online. For 8.5X11” paper scaled images, I found that at least 500 pixels in each dimension made decent enough stickers. The higher resolution, the better. 3) Resize the images. I used Photoshop to make them the right size to fit on my paper. I’m assuming everyone has a favorite photo-editing program. Use that. Make them fit on paper. If you have decent resolution to start, keep it at 100-300 pixels/inch or so. You don’t need any higher resolution than that for this. 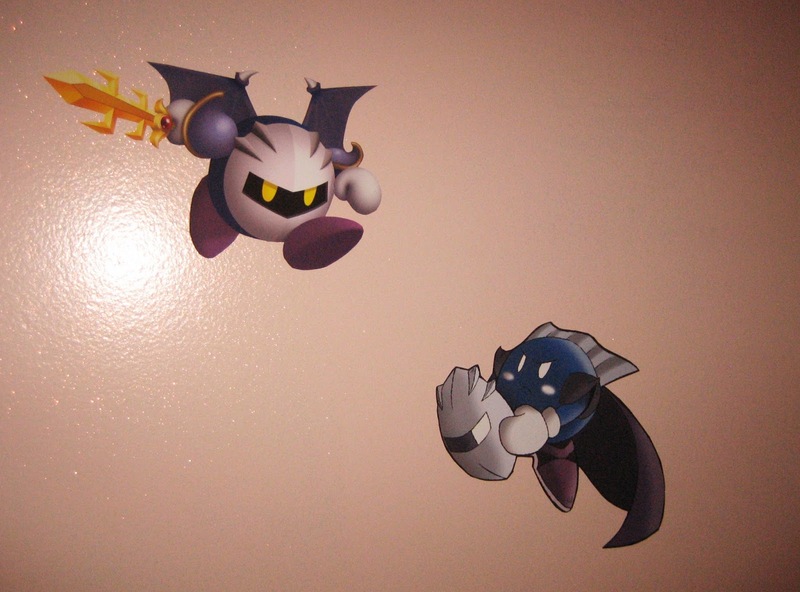 4) Print your images onto the vinyl. Use the glossy photo paper setting. I just did normal quality, and they look good enough to me, and my kids are thrilled. 5) Let them dry and then carefully cut them out. I’m sure you could use a utility knife or some fancy stuff to cut them perfectly. I used my junk drawer scissors. The directions say to let them dry for at least 15 minutes. They seemed quite dry to me after just a few minutes. 6) Peel and stick. The peeling can be a little tricky to get started. You know, stick your fingernail in or kind of mush the vinyl sideways with your finger until a little edge comes loose. Be careful at thinly cut parts not to tear the vinyl. Stick em on the wall. Be a hero. 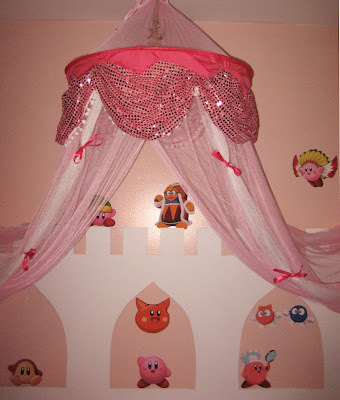 Princess room becomes Kirby-themed "King Dedede's castle!" 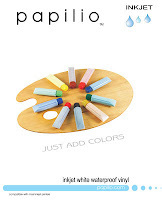 So basically, my entire tutorial is, like, go buy Papilio vinyl sheets. Yup. You’re right. I don’t work for them. I didn’t get paid to tell you this. There may well be other products that would do the same thing. I did this. It worked. A note on the vinyl. 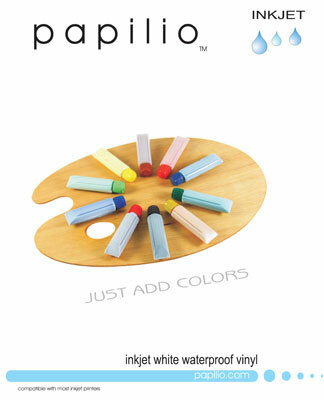 Papilio also makes a product called “removable” vinyl. That seems like it would be the right thing, but it isn’t. It peels right off the wall while your child sleeps and then they cry in the morning, and you cry too because you foolishly bought 100 sheets of it for $70-something and it didn’t work. Boohoo. The stuff I used is labeled as “permanent” adhesive. That seems scary, I know. I tested a sticker in an unobtrusive area for 2 weeks and it came off fine. The paint finishes in my kids’ rooms are eggshell or satin or some other word that means somewhere between flat and semi-gloss. One has a glitter glaze. Neither finish was damaged at all after two weeks. Beyond that, I can’t make promises, but two weeks seemed like a reasonable test period to me. I encourage you to buy a single sheet and do your own testing on your wall to make sure it’s safe.